My family’s first visit to the Gaylord National Harbor was during the summer of 2008. Although we weren’t able to book a room (last-minute doesn’t tend to work with the Gaylord), we still wanted to see the largest non-gaming hotel and convention center on the East Coast. We’d planned to spend a day at the National Harbor exploring. At the time there were no “10 Things For The Family To Do At National Harbor” lists to research. It was all brand new and we had to discover on our own (ahh, the good old days of travel). When we started walking around, I remember thinking to myself, “Thank goodness for the Gaylord!” Aside from the resort’s amenities and the Awakening (a.k.a the hand in the sand) cast iron sculpture, there wasn’t much for kids to do. Fast forward six years, and though the Gaylord is still the anchor of National Harbor, there’s dozens of things for families to do, a complement to the Gaylord’s offerings. Now when we visit, it feels like an itinerary-rich vacation. 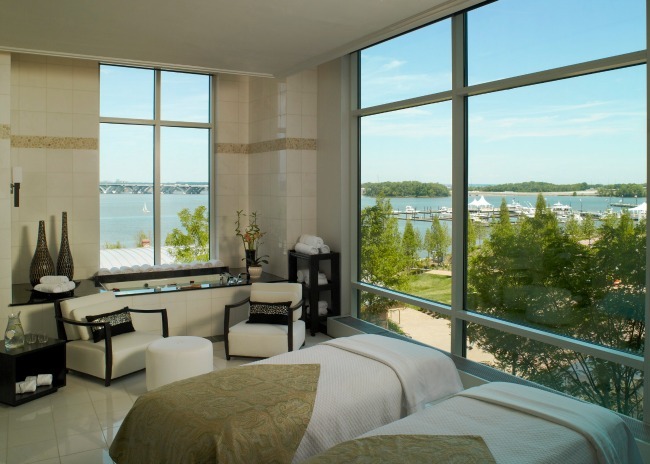 At the beginning of June, we got an early jump start on summer and enjoyed a staycation at the Gaylord National Harbor. Location, location, location. You’d be hard-pressed to say “there’s nothing to do” staying at this resort. Aside from the Olympic pool, there’s on and off-site shopping, a nightly water show, special events, and a host of other nearby attractions. 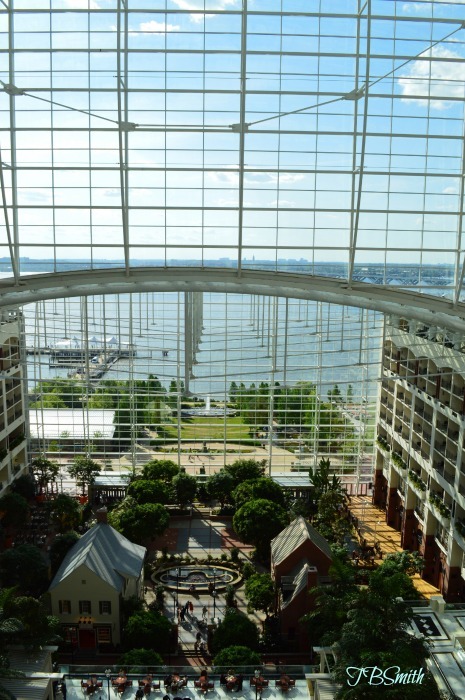 The concierge desk at the Gaylord will even help coordinate a suitable itinerary for you. Part of the Marriott network. Marriott International acquired the Gaylord resorts almost two years ago. We’ve been rewards members for years so it’s nice to know that we can use our rewards points for stays at one of our favorite luxury family resorts. Breakfast at the door. Well, technically it’s downstairs in Pienza, one of the Gaylord’s four on-site restaurants, but I guess you can order room service if you’d rather have it at your door. I’m not a fan of getting up and searching for breakfast or settling for crappy “free breakfast” choices. The buffet at Pienza, though it could use a few more diverse options like gluten-free or turkey bacon/sausage products, had something for everyone in my family. 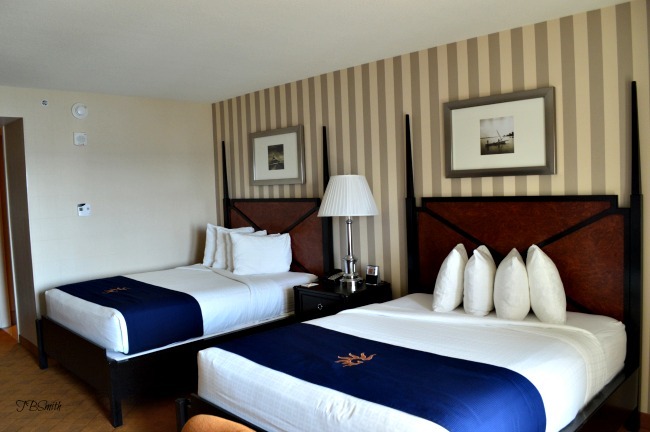 Beautifully comfortable rooms. 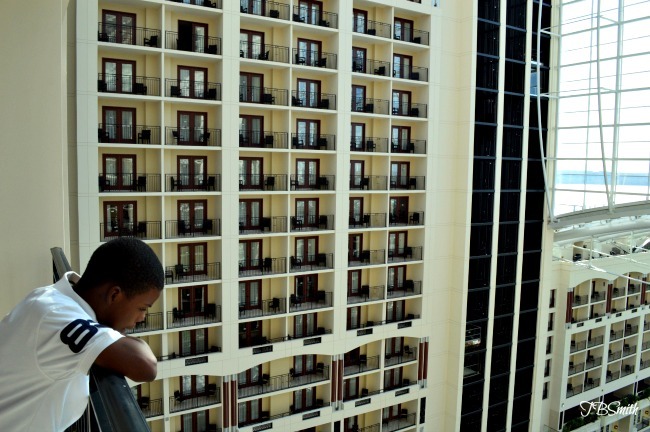 We stayed in an atrium suite on the 14th floor that faced the Harbor straight on. 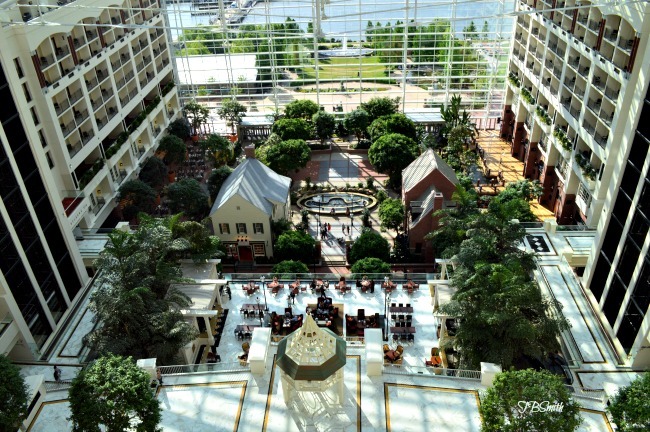 I highly recommend that you book an atrium room to enjoy the full splendor of the Gaylord. We had impeccable weather, sunny and bright – not a cloud in the sky. Talk about an amazing view. Not only did we have prime real estate for the water show but we were able to watch the fire works from our balcony. The evening and morning views of the Harbor that reflect through the 19-story atrium glass are quieting. My boys also appreciated the room as they sat on the balcony decorating sugar cookies to the tune of squealing kids and classical atrium music below. Relâche Spa. Okay so this one may not be “for my family”, more like “for me” but it’s imperative that mom gets some pampering on the schedule. A happy captain makes for a happy crew and ship. Relâche spa is a quiet retreat from the hectic world ten feet outside its doors. No matter how many minutes you purchase, when you have a well-trained expert working your body, the time is never enough. Guess what? Summer’s not over yet. You can still get in some quality family vacation time at the Gaylord National Harbor and enjoy all the new attractions in the surrounding vicinity. Enjoying the atrium balcony view. Sign up for The Gaylord’s newsletter. This is where you’ll get a first hand look at their running specials and packages. You can get wonderful deals during the winter but if you’re quick and plan ahead, you can also snag a room at an enviable discount during the Spring and Summer as well. The Gaylord is a luxury resort and it’s in a high-priced waterfront area so if you want to save money on food, eat off site. We ate at Pastime Sports Bar and unfortunately were underwhelmed. Prices were a little high for the quality of food that we received and options were limited. For our family of four we paid close to $90 for our bar-food meal. Venture outside and walk around the Harbor – you have dozens of other options that may suit your tastes and your wallet better. The Gaylord National Harbor sponsored my family’s visit. I received no compensation for this post. All opinions expressed within are my own.